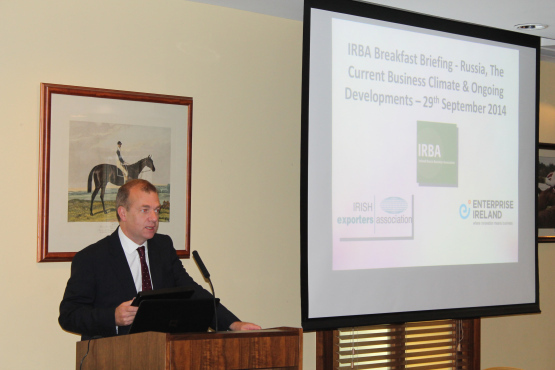 The IRBA Business Breakfast Briefing took place on Monday, 29th September 2014 this week, to take an in depth look at the current Russian business climate and and ongoing developments. The IRBA’s primary activities include: educating its members though various events, connecting with the market and peers, assisting on policy by engaging with related public bodies and organisations. Gerard MacCarthy, Director, Enterprise Ireland Russia / CIS & Head of the Commercial Department at the Embassy of Ireland in Moscow spoke at the event alsong with IRBA Chair Dr Constantin Gurdgiev who looked at issues of economy and macro-risks e.g. rouble valuations, credit supply, sanctions impact and risks for Russian demand side. Irish companies in the food sector have been hit hard, primarily by Russian sanctions against Europe, but also by the pork ban introduced at the beginning of the year, costing Ireland in total an estimated €100m in food related exports in 2014. Opportunities still remain, particularly in genetics, ingredients, and food technology / agricultural consultancy, and it is hoped that the current ban will be lifted in the short term. Despite a volatile and unpredictable multilateral political landscape in the Russia/CIS region, Irish non-food companies have shown agility and resilience in engaging with what is, after all, the 3rd biggest non-EU exports market for Irish companies after the US and China. For Russian translation and Russian interpreting, contact Instantranslation.ie or RussianTranslator.ie.